Here’s the thing about Lillian Gish. In the 1949 drama, A Portrait of Jennie, Gish’s total screen time is about 10 minutes. TEN MINUTES. And yet, in many ways she is the pivotal character, the fifth column, as it were; the one who brings Truth to the story. A Portrait of Jennie is a film about Truth, judging by the endless quotes presented at the beginning of the film. (Here is an example.) This is a bit much, because since when does Hollywood care about Truth? A Portrait of Jennie is also an Art Film. We know this because some establishing shots are transposed on a canvas texture. This is highbrow stuff, see? However. For all the schmaltz in the script, we are treated to some amazing performances in this film, not the least of which is by Ms Gish. Briefly, the plot: A poor and unknown New York artist (Joseph Cotten) meets a slightly strange but pleasant young girl named Jennie (Jennifer Jones). She is cheerful and friendly, but disappears without warning. As the film progresses, Cotten has more chance meetings with the girl, but each time she has grown older. He begins to sketch the girl and then, finally, paints her portrait. As he does so, he begins to fall in love with her. This film messes with your mind. Jones grows older – perhaps as much as ten years older. Yet, in “real” time, the movie takes place over a single year. It’s a terrific time manipulation trick. 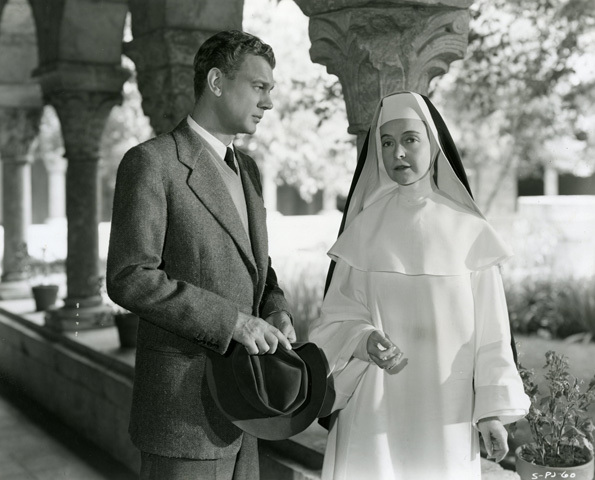 Now, on to Ms Gish, who plays Sister Mary Mercy, a nun at the convent where Jones attends college. Jones says the sister is her favourite because she brings – are you ready? – Truth to things. Gish, known as “The First Lady of American Cinema,” was a huge star during the silent era and had a career that lasted over 70 years. In A Portrait for Jennie, Gish would be in her fifties, and she’s almost too beautiful to be a pious nun. Through her conversation with Cotten, you can see that she is every bit as spiritual and other-worldly as we expected. Gish has some antiquated lines, but delivers them with charm. “What vision has been vouchsafed to you, I can’t say,” she tells Cotten. (Who TALKS like that?) But Gish speaks with such care that we feel a little sad words like “vouchsafed” have been removed from everyday conversation. Her character is a cultured, gentle soul, but strong enough to rival Cotten’s screen presence. She has to be; she is the pivotal character who tells us What It All Means. It takes a seasoned professional to count for this much in under 10 minutes. Gish knows how things will end, and gives us a clue with her soulful eyes. We think we can guess the ending – but we can’t! The ending has a twist that we do not see coming. A Portrait of Jennie is a special film, despite all its self-aggrandizing. It’s a haunting story with pitch-perfect performances. And even if it weren’t, it would be worth seeing for Lillian Gish alone. Portrait of Jennie: Starring Jennifer Jones, Joseph Cotten, Lillian Gish. Directed by William Dieterle. Written by Paul Osborn and Peter Berneis. Selznick Releasing Organization, B&W and Colour, 1949, 86 mins. 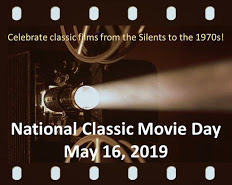 This post is part of The Gish Sisters Blogathon, hosted by the lovely Movies Silently and The Motion Pictures. I love this movie, and the novella it is based on is also pretty effective. I haven’t read the novella, but am keen to compare it to the movie. You probably own the novella, yes, in your fabulous library? You’re certainly right about Gish’s soulful eyes. As you observantly point out in your review, this is a great example of how she could do so much- even while being given so little to work with. Wonderful write-up Ruth! Thanks, Kellee. Her eyes were so expressive, weren’t they? She really was one of the greats. I’ve never seen this film but certainly want to now! That portrait you posted at the beginning of your post is gorgeous! Wonderful post, R.A.!! Isn’t that a stunning photo? Lillian is wayyy too beautiful in this film. Goes to show you don’t need an entire movie to steal the show! I really enjoyed your review, I’ll be adding A Portrait of Jennie to my (ever expanding) must-watch Gish list! I hope you get a chance to see it. This is a truly haunting film, one that sticks with you. Yes, indeed, Miss Gish was certainly beautiful at all ages, wasn’t she? Hard to believe she’s in her 50’s in that photo. Don’t we all hope to age like she did! Thanks for bringing this film to my attention. It’s one I’ve never seen before. Patti, YOU of all folks should see this one. I hope I’m not overselling it, but I think you would really enjoy it. “Romantic, haunting, moody” are perfect descriptions of this movie. We should start using the word “vouchsafed”, no? See how many strange looks we get! She’s a little scene-stealer, isn’t she? But not in a malicious way. Her character needs to be prominent, and it’s to Cotten’s credit that he didn’t compete with her. That was an excellent choice. Lillian Gish made such a short appearance, but she tied the whole story together. You’re right, that takes a powerful presence. Also, you’re right that is sad that we don’t say “Vouchsafed” any more. Thanks for sharing. After watching the movie, I realized they NEEDED Lillian Gish for that role. I tried to think of another person who could give the same depth and other-worldiness to the character, and I couldn’t think of anyone. Ha – I’m glad I’m not alone in my love of “antiquated” words. Thanks for dropping by! I hate to admit it, but I’ve yet to watch one of her films 😦 I better remedy that very soon! Thanks for posting this! No need for sorrow – think of all the wonderful movie-watching you have ahead of you. Thanks for dropping by. Thanks, Fritzi! Am learning so much about the Gish sisters with this blogathon. Great idea! Ruth, I agree: “Since when does Hollywood care about Truth?” 🙂 Still, PORTRAIT OF JENNIE has intrigued me despite being another one of those movies that I only ever find myself seeing right smack in the middle of the movie in progress, but the scenes that I’ve seen struck me as quite ethereal and poignant — all that and the great Lillian Gish, too! 🙂 Incidentally, if you look sharp, you’ll see young Anne Francis in the museum scene! Loved your warm, witty review in the Gish Sisters’ honor, my friend! Dor, I know exactly what you mean about always catching the middle of some movies. For me, it’s the noir with Marie Windsor, where she’s under arrest and is being transported by (police? federal agents?) via train. I don’t even know the name of it, for pete sake. Will watch for the young Anne Francis in the museum. Thanks for the tip! Ha ha! Great idea to start using “vouchsafed” in our blogs! Who knows – maybe it’ll come back into vogue! This is a very interesting movie. The costume & makeup folks worked magic with Jennifer Jones & her growing-older process. I think you’d like it. I remember feeling a bit let down by this movie the first time I watched it, but I loved the way you wrote this article and it made me want to rewatch it! I never thought I’d say that about this film. Ruth, you’ve sold me . . . Looking forward to watching this gem! I think you’d really like this one, El Androos! I find this to be a strangely beautiful movie, and you’ve written such a wonderful post about it! Gish’s delicate yet powerful performance really adds to the mystery of the story and her character. You’re right about Gish. The movie is haunting, but Gish really adds a mysterious, spiritual quality, doesn’t she? I really enjoyed this movie, especially because I’m a big fan of Joseph Cotten, but thanks to your review I’d like to watch it again and pay more attention to Lillian Gish’s performance, small as it may be. I loved her in The Night of the Hunter, but don’t know if I realized who she was when I watched this movie. I’m a big fan of Joseph Cotten too! I can’t think of a single performance that I didn’t like. As for Gish, she really was terrific in “The Night of the Hunter”, wasn’t she? That is another movie with fantastic performances. I am not at all familiar with this film and have not seen Ms. Gish in many films at all. This blogathon and your review, in particular, has given me an idea of what I’ve missed. This is another film for my list. Thank you. Some people find this movie a bit schmaltzy, but it really is a haunting, thought-provoking film. This is a terrific blogathon, isn’t it? I am learning so much about the talented Gish sisters. The last time this film was on TV I couldn’t watch because I had a commitment, but how I want to see this one! Not only because of Lillian, but also because of the great but not so much praised Joseph Cotten. Joseph Cotten really does deserve more press than he receives, doesn’t he? I hope you get another chance to see this film – every actor in it is superb. I just watched Truffaut’s “Day For Night” the other day and it had a tribute to the Gish sisters. Interesting to come here and see a blogathon being done about them! Ooh, “Day for a Night” sounds like one I need to see. Well, this is my thought about Lil in this film: great casting because she always seemed to me that she would rap my knuckles for some moral infraction! Great post and choice – as Cotten and Jones weave some delicate magic here. Ha ha! Seems like she wouldn’t think twice about rapping anyone’s fingers. Aren’t Cotten and Jones wonderful together in this film? Your phrase “delicate magic” is poetic and perfect. This is such an interesting movie – the mixture of magic and melodrama. And so visually beautiful. It is, indeed, haunting. Miss Gish onscreen embodied such soul – no matter how big or small the role. Wonderful review. Lillian G. is so good in this role, you’re sad that she has such limited screen time, no? I like your description of “magic and melodrama” – that perfectly describes this movie. You’ve got me intrigued with this posting, Ruth – I definitely want to see this one now, especially as I like Cotten a lot as well as Gish. Will hope to track it down soon! Judy, I think you should see this one. I think you’d really appreciate its artistic merits.